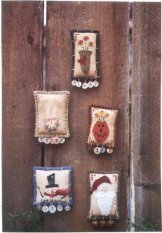 Get out the old buttons, old doorknobs, wooden bobbins or candlesticks and stitch up one of these cool pincushions! Be creative and make-do with what you can find to make yours unique. Old tags add to the antiquity of these pincushins. Tags available under accessories. Pattern for a 21" primitive sheep doll. 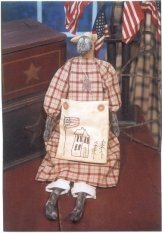 Patriotic embroidery to her apron makes this sheep so special! 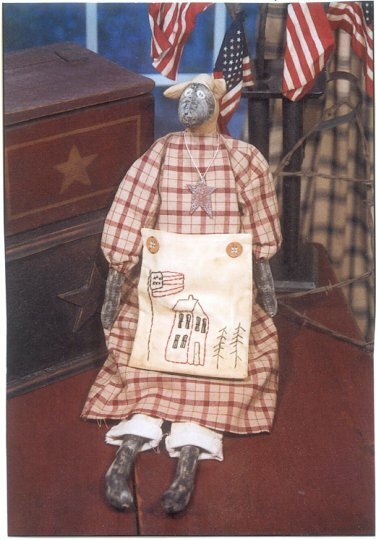 A special antiquing technique makes this doll look very old. 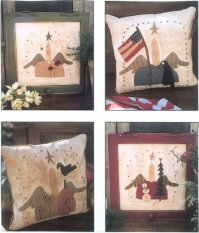 This is a great pattern for 3 seasonal pillows. 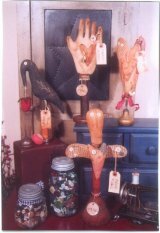 Great way to use up all those scraps! This pattern will keep you busy through out the year! This pattern is simply precious! Pattern includes instructions for an 8" angel pillow, 14" x 30" table runner and last but not least a crow plant stake! This pattern simply touches the heart! The pineapple has long been a symbol for hospitality. Raw edge fabric applique and various embroidery stitches add to the charm of this pattern. 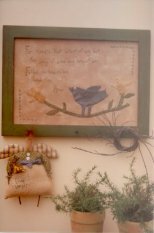 What a great way to welcome each new season and most importantly - your friends and family who frequent your home! 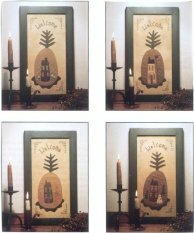 This pattern consists of four charming cherubs - one for each season! 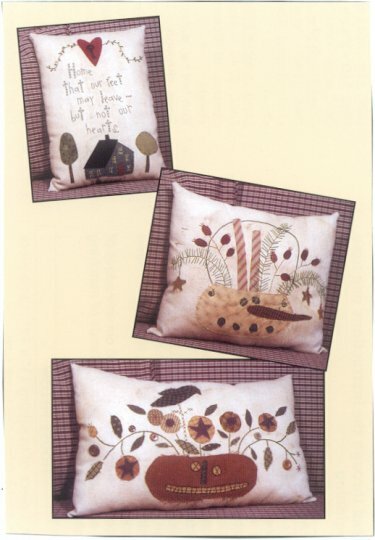 Raw edge fabric applique, various embroidery stitches, wool accents and old buttons add to the charm of this pattern. Make into a pillow or frame up for a special picture! Decorate the lapel of your coats throughout the year with these darling little pins. 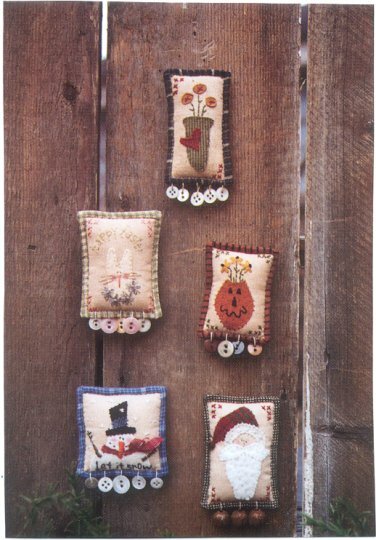 The Santa and snowman ones also make darling Christmas tree ornaments. 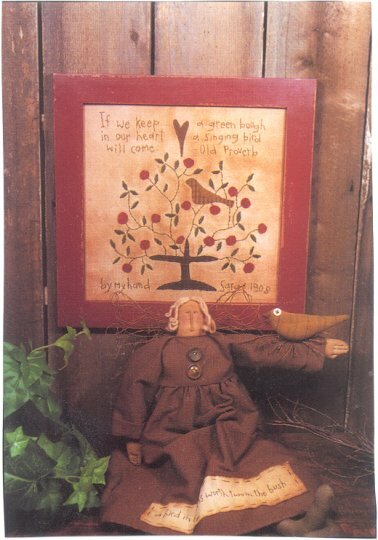 A fun and folky pattern for a hand appliqued picture, and angel doll. Picture measures 11" x 16" and doll is 9" tall from tips of twiggy toes to top of fuzzy head of hair. 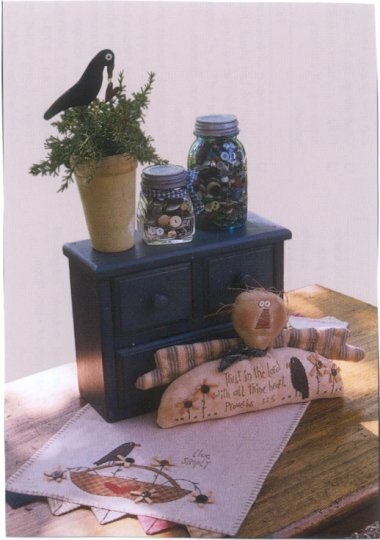 Pattern for the bird lovers, includes a 19" doll and an 11" x 11" embroidered picture. 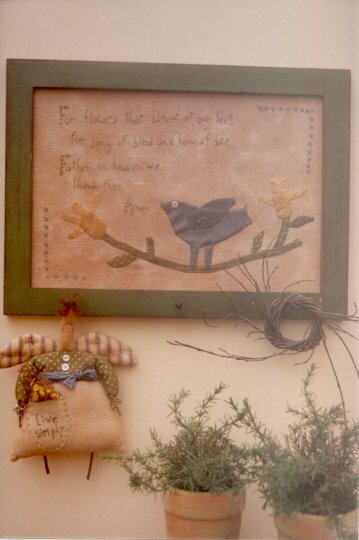 Verse - If we keep a green bough in our heart, a singing bird will come. 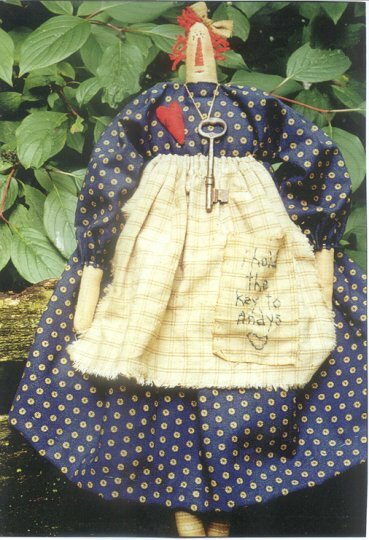 For all the Raggedy Ann collectors - this pattern includes a darling 18" doll sporting a messy red hairdo and a 6" x 8" embroidered stitchery.